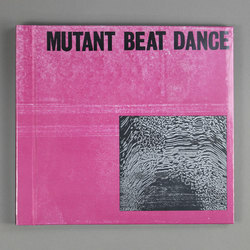 Mutant Beat Dance - Mutant Beat Dance. Bleep. Mutant Beat Dance have been knocking about for almost a decade now, so it’s no surprise that their debut album presents a surfeit of ideas. This trio of Beau Wanzer, Steve Summers and Melvin Oliphant (you may know him better as Traxx) serve up 25 tunes on this eponymous record. The guiding principles here are derived from synthwave, minimal synth and other strands of post-punk electronics. Nearly everything comes cloaked in a veil of static that lends even the more footloose numbers such as ‘Funk Groove (Skit)’ an air of muffled menace. Mutant Beat Dance LP is notable for featuring three members of LCD Soundsystem - Pat Mahoney and Tyler Pope on ‘Feed The Enemy’, Gavin Rayna Russom on ‘Geometrical Disease’.